We get some requests for (and many questions about) Canadian diamonds for use in engagement rings and other jewellery. Here are some of the most important things to know about this precious natural resource residing in our home and native land. Many people are surprised to find out that Canada has diamond mines. In fact, Canada is the 3rd largest diamond producing country in the world! The image shown above is an aerial view of the Diavik diamond mine in Canada’s Northwest Territories. Producing 8 million carats annually, it’s been in production since 2003. An interesting fact about this mine is that it’s only accessible by road for two months of the year – when the surrounding lakes are frozen enough to allow for the construction of a road stretching 375km long, from Yellowknife. Canadian diamonds are known for their guaranteed “conflict-free” origin. In order to verify this origin, many certified Canadian-mined diamonds have a unique identification number laser inscribed on the stone itself (don’t worry, this is invisible to the naked eye, is on the side of the diamond and doesn’t affect its brilliance in the slightest!). Just because a diamond was mined in Canada does not mean that it was cut locally. The majority of Canadian-mined diamonds are actually shipped overseas to the major diamond cutting centres of Belgium, India and Israel before they are brought back here to be placed on the hands of Canadian consumers. This is because the cost of manufacturing in Canada is prohibitive for the smaller stones, and the local manufacturing skill is lacking for the larger ones. As you can imagine, mining in Canada is more costly than in some other countries. There are also additional costs associated with the tracking and certification process Canadian diamonds undergo. Some retailers choose to price their Canadian diamonds at a significant premium over non-Canadian goods. Other retailers choose to price the Canadian goods almost on par with diamonds of other origin knowing that they’ll sell faster. The presence and extent of a premium on these diamonds really varies from retailer to retailer. Just like diamonds of other origin, Canadian-mined diamonds come in all shapes, sizes, clarities and colours. There is a common misconception that Canadian diamonds are “higher-quality” than non-Canadian diamonds. This belief stems from the fact that on average Canadian diamond mines produce a greater percentage of higher-quality diamonds than mines in other parts of the world. However, chances are that you are buying a single diamond… not an entire mine (but if you want to, let’s talk)! Each diamond is graded on the 4C’s individually, and this is how they are compared. A high-quality diamond from elsewhere will be much nicer than a poor-quality diamond from Canada. So should you buy a Canadian diamond engagement ring? Not necessarily. The guaranteed conflict-free origin is a significant pro and the fact that the diamonds were born right here in Canada is great, but you must evaluate each diamond on its own merit in order to arrive at the best selection for you or your loved one. I had a client recently who spends a lot of time up north for work, from where he would frequently return to his girlfriend (now fiancée!) with gifts of Inuit art. As Canadian diamonds are mined in northern Canada, he was set on popping the question with one of them in hand. 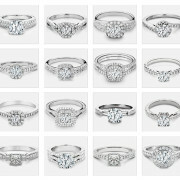 For him, purchasing a Canadian diamond was a no-brainer, and we focused his selection on only those. It truly is a personal decision! At Kimberfire, we are here to assist you whether you are set on purchasing a Canadian diamond or are open to other options. Let us know your preferences when making an appointment and we’ll make sure to have all the bases covered so that you can make a confident decision. Why wait until your appointment though? If you have any questions that still need answering please ask them in the comments section below and we’ll get right on it! Very amazing facts about Canadian Diamond. I never thought Canadian Diamond have these things, truly mindblown! Thinking of purchasing one soon. Will definitely share this post too! Thanks for this. I was unaware that Canada was the 3rd largest diamond producer in the world. In Australia we are running out of the Argyle pink diamonds, should be fully depleted by 2020 they say. The Argyle mine produces some very beautiful diamonds. Thank you for reading! How much is a 3 carats, VVS1, colour D cost ? Hi Estrellita, thank you for your inquiry! We’ve responded to you via email. You have clear each basic doubt about Canadian Diamonds. Thanks for sharing such information.